+ How did you determine the company value--and is it accurate? Operational value is calculated using a patent-pending methodology by comparing your client's company to thousands of closed company sales. CoreValue operational value calculations have been back-checked by hundreds of independent professionals. Download the white paper to see the methodologies, understand the customer value, and how you can leverage this as a consultant. + What if we can't provide all the services they need? Fortunately, CoreValue allows you to provide a complete assessment—so you can identify all the weaknesses, but it highlights the specific areas where your services can help. It also puts you in the position as the primary consultant—and you can provide (refer or sub-contract) other trusted specialist to address any areas where your client needs help (providing an infinitely scalable model—with you in the middle). This is a model used by some of the top consulting firms in the world (macro or micro). + How do I get the bandwidth to create a new practice area? The easiest customer to close is the one you already have—it's good account management to sell additional services to existing clients. The CoreValue free assessment process is a fast, easy way for you to uncover new service opportunities with your existing clients at a minimum cost in time and dollars. And the executable growth plan is a rodmap for delivering services... Everyone wins! + How do I sell this? No problem. CoreValue is not software—it is a complete “system” (a Consultant-In-A-Box), like a franchise consulting model (without the heavy fees). You get the assessment system, but also scripts, email and web messaging, marketing content, and a documented step-by-step process—everything you need to either start and/or grow and scale a consulting practice. You can sell this. + How do I buy CoreValue? Whether you choose A-La-Carte or Unlimited Use, you get free online rapid orientation and support! Unlimited Use bundles get automatic volume discounts. Plus, the Unlimited Use bundles include FREE access to CoreValue and NACVA “Build Your Practice” training! You get the technology, marketing, and client engagement training you need to build a thriving consulting practice. CoreValue Unlimited is $2,995 for one advisor, and volume discounts start from the second advisor. You can easily launch your account online at www.corevalueforadvisors.com--all you need is a credit card. Or call the CoreValue expert staff at (603) 835-3444 option 2. + What happens after I buy? You will be provided with a CoreValue account where you can login and access a convenient dashboard. 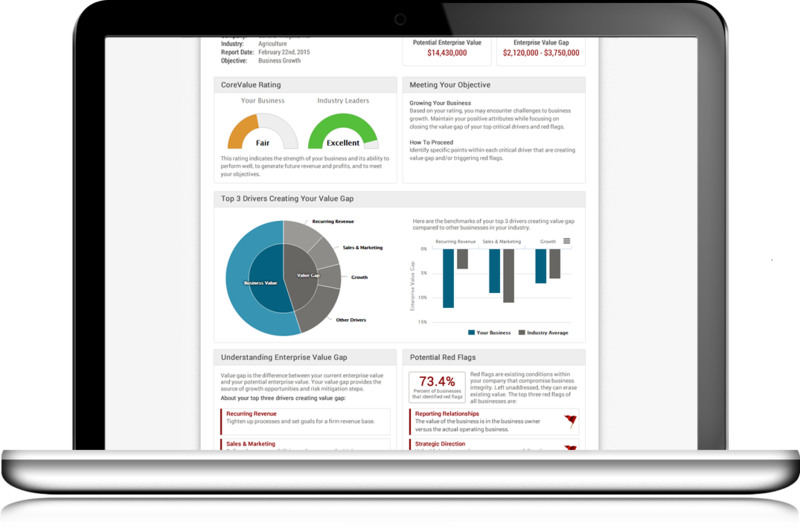 From your dashboard, you can review training videos, download marketing collateral, generate leads using the Free Discover Report, and initiate multi-year engagements using the Unlock Deep-Dive Analysis and Executable Growth Plan. For CoreValue Unlimited, your Customer Success Representative will call to schedule your “Build Your Practice” training and first onboarding call.